“The State has launched an application for a referral of the accused for observation in terms of Section 79 of the Criminal Procedure Act. The application is brought in terms of Section 78, subsection 2 of the act. She then references the case law used to help guide her decision. “It is clear that counsel for the State was correct when he submitted that the court has no discretion once either of the two requirements has been met. The trigger to the application was Dr. Merryll Vorster, a forensic psychiatrist, called on behalf of the accused. Counsel for the State submitted that it was clear that the evidence of Dr. Vorster was that the accused suffered from a generalized anxiety disorder and at this stage of the proceedings, was calculated to make up for the accused’s bad performance as a witness. He submitted that the facts of the evidence of Dr. Vorster may become important should the court reject the evidence of the accused, hence the application for referral. In opposing the application, counsel for the Defense submitted that there was no allegation as envisaged in the act, or if there was, it was not substantiated. He submitted further that it did not appear that at the time of the incident, the accused was not criminally responsible. For these reasons he argued to the application could not succeed. •The accused, amongst other things, was hyper-vigilant. The doctor went on to explain that hyper-vigilance is somebody who is constantly looking around scanning their surroundings for any kind of threat. •Dr. 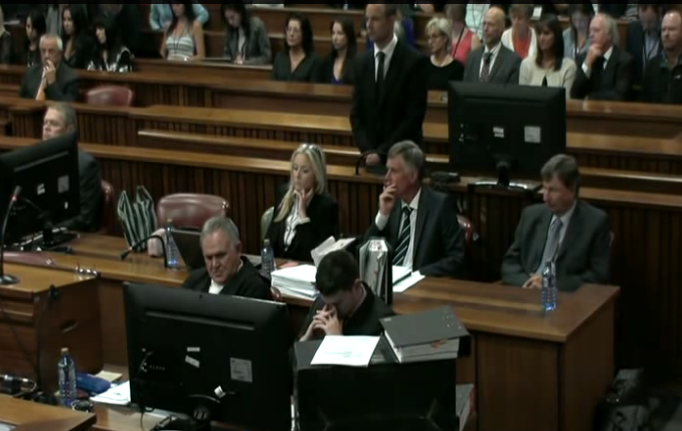 Vorster mentioned two aspects that would have been operating at the time of the offense: 1) The accused’s physical vulnerability, amputation, which prevents him from moving around easily. 2) The generalized anxiety disorder which was pervasive and had been present for many years which would also have been present on the day of the offense. The Judge says, in consideration of the statement above, a debate about what the generalized anxiety disorder really is or where it may fit in within the act, would be a fruitless exercise. Nowhere in the act is there a definition of mental illness. There is however an indication from case law that it would be unwise for the court to attempt a diagnosis without assistance from the relevant experts. Mental illness and mental defect are morbid disorders that are not capable of being diagnosed by a lay court without the guidance of expert psychiatric evidence. 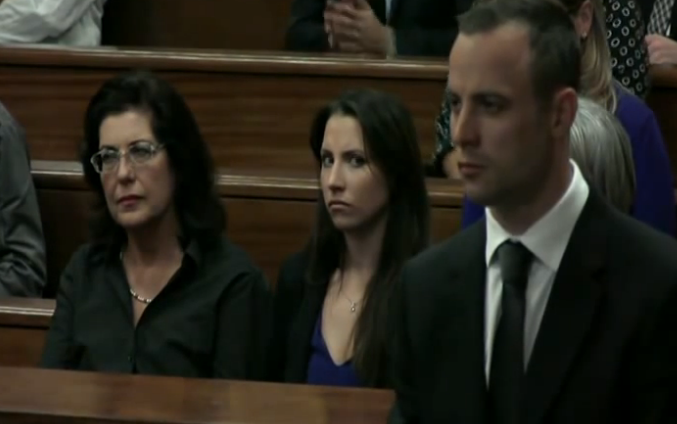 The Judge also says that Dr. Vorster’s evidence was placed before the court by the Defense. The fact of the evidence is that a doubt has been created that the accused may possibly have another defense relating to his criminal responsibility. There is also a possibility that there may be diminished criminal responsibility. Dr. Vorster’s evidence has not and cannot be contradicted in the absence of other psychiatric evidence. This lay court is ill-equipped to deal with the issue raised in Dr. Vorster’s evidence at this stage. The allegations in the report of Dr. Vorster and the views expressed by her have substance and what is more, they are in line with the accused’s evidence. That in itself is significant. Dr. Vorster’s report, however inclusive it may be, cannot replace a proper inquiry made in terms of the act. Among other things, Dr. Vorster had only two interviews. The duration of the interviews is not stated in the report. It appears she may have had very little time to compile her report. A proper inquiry which would be more comprehensive would ensure that the accused gets a fair trial. Counsel for the Defense submitted that the application for referral was premature as he intended to call another witness who would give evidence on the fight or flight response. This witness would explain the concept in detail, Defense argued, and if the State still wanted to make the application afterward then they could do so. In the Judge’s view, the question is whether the applicant (the State) has made out a case for the relief that is sought at this stage. 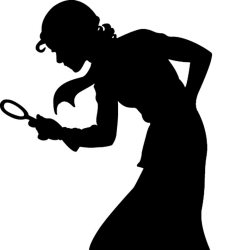 If it has, she fails to see how this additional witness’s evidence will assist the court to determine whether a referral is sought by the State. It is so, as counsel for the State submitted during argument, that a referral inevitably means more delays in finalizing this matter. This is not about anyone’s convenience but rather about whether justice has been served and it is not taken lightly. The Judge is satisfied that a case has been made out for the application sought by the State. The order is granted, however the specific order will be handed down next Tuesday, May 20. Nel says that he and Roux have agreed that they will assist the court with the order. They will have it ready by Tuesday morning and will make sure that they are both in agreement. Roux then mentions the possibility of outpatient referral, as well as a psychologist on the panel (in addition to the psychiatrists). They will be making recommendations for the court to consider. The Judge wants to place on record that she’s glad that counsel agreed on this. The Judge says that the aim of the referral is not to punish the accused twice. So if there is a possibility of making sure that he’s an outpatient that would be preferable. Nel says that it will be investigated. And Nel is 100% on the mark when he says that the court must take in to consideration the timing of the psychiatrist’s evidence. How could they not? Oscar has been talking about the phantom intruder since the day of the shooting, so why in the world would they not use this right from the very beginning of the charges to shed some light on a very bizarre story. They knew the world was scrutinizing his story and a GAD diagnosis, if sincere, could have potentially helped them. The only thing you can infer from them waiting until May 2, 2014, is that this is their Hail Mary moment, and this Judge is too wise not to fully appreciate that. The fact that their expert mentioned on the stand that her evidence could go towards the merits for conviction OR towards sentencing, is a clear indication that they are just covering all of their bases. To do this at the very last moment indicates that it was not planned from the start. 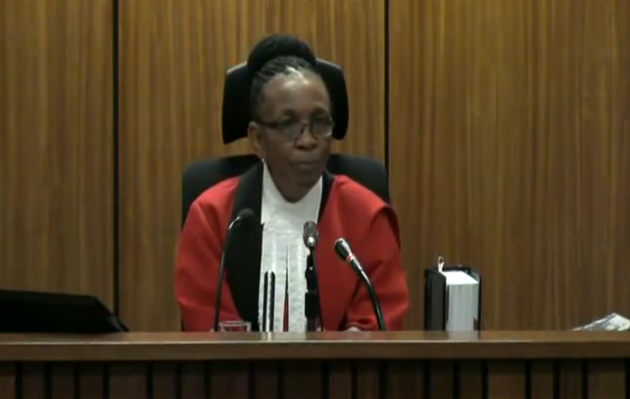 As the Judge says, Dr. Vorster’s evidence can’t be tested or contradicted in the absence of other psychiatric evidence, so the court is ill-equipped to deal with her evidence. They had no choice but to have him evaluated. The Defense can’t have it both ways. They can’t just lay this evidence on the court as a factor for consideration and then turn around and say it has nothing to do with his competency. Some people are worried that Oscar will go through 30 days of evaluation, and the doctors will agree that he does indeed have GAD, and he will walk free. From all I have read, that is not at all how this works. Having GAD, does not automatically mean that they deem you free of criminal responsibility. Not even close. The Judge specifically pointed out that the panel needs to determine if at the time of the offense, the accused suffered from a mental disorder which could have resulted in his not being criminally responsible for his act. That is usually a pretty hefty thing to prove. •If he did not, and is deemed mentally competent at the time of the offense, then the GAD is simply a part of the story. If the court does not believe Oscar’s version, then the GAD is useless. They will not give it any weight in verdict or in sentencing. •If he is deemed mentally competent at the time of the offense, and the court does believe Oscar’s version, then the GAD could potentially help him in both verdict and sentencing (if applicable). •If the panel comes back and says that Oscar was NOT mentally competent at the time of the offense, well then, the case is over. Oscar will go straight to a mental institution for an undetermined length of time, quite possibly a very long time. I really, really do not see this happening. And I really do not believe that Oscar wants that to happen. Again, from all I’ve read, you cannot fake mental insanity in these types of evaluations. I believe that when Oscar is done in 30 days, the case will resume. I really have no clue if they will deem the GAD diagnosis valid or not. But even if they do, I believe strongly that the State has been successful in discrediting Oscar’s evidence. I don’t think the GAD will matter. And he won’t be able to bring it up on appeal, nor can he weasel his way in to a lighter sentence. This could be a huge win for the State. That is my opinion. I welcome any and all comments to my thoughts above as I am not a mental health professional, nor am I a South African citizen. I am just relaying the information that I have read from various sources and applying it to my interpretation of the case. One final thought… the Judge’s statement “the aim of the referral is not to punish the accused twice” was pretty shocking. I have listened to it quite a few times now to see if I can put it in to any other context, and I can’t. It really seems to me that she is foreshadowing some type of punishment in this case. Would love to hear everybody’s thoughts about that so please do share. 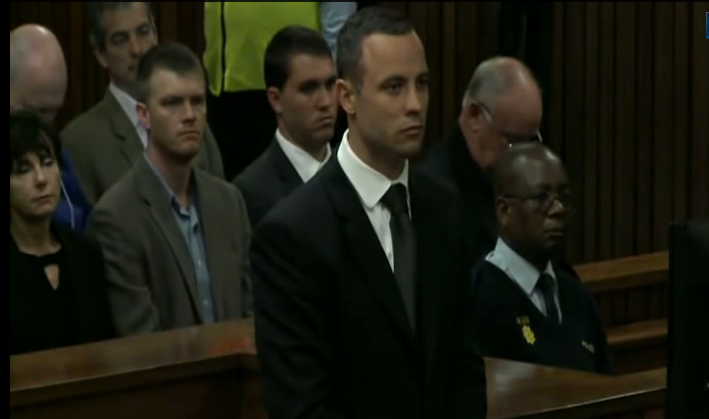 See the YouTube video below for Arnold Pistorius’ response to today’s judgement. NOTE: This response makes no sense, considering the Defense strongly contested this referral. Whatever the truth, (and any rational person knows what the truth is by now!) Oscar acted like a mad person that night and needs to be evaluated.This is absolutely the correct decision. I wish we could just fast forward to the closing arguments, verdict and sentencing. Uncle Arnold knows that they’re on a sinking ship and is just doing some damage control after Oscar’s father’s unfortunate comments to press and Oscar’s stated belief on the stand that the police are ineffective. If Oscar had just come clean immediately, confessed that he shot her in a moment of insane rage and had taken responsibility for his actions he may have got off with a lighter sentence and her family may have eventually found it in their hearts to forgive what he did. His lying under oath, in the presence of his god and Reeva’s family is despicable and for this he deserves a very lengthy jail sentence. The question remains: what could possibly have happened or been said that sparked his murderous rage? Was it plain old-fashioned jealousy or something so deep and dark that Oscar would rather risk a jail sentence than confess? Hopefully the panel of psychiatrists will be able to unearth something ….. Yes, I definitely agree that it was the correct decision to refer him. All of this GAD stuff is a smoke screen… the real question at hand is was he mentally competent at the time of the offense and that is what the Judge has ordered the doctors to determine. That’s all we need to know. Hello. With regards to Frank. It could be possible he wasn’t at the house. Hanging out with the security when op is ‘entertaining’ but then you’d think he would say he wasn’t at the house rather than he didn’t hear anything. But it also seems like such a big coincidence that Frank would be out of the house at 3am when all of this is going down, but somewhere within the immediate vicinity to put him back in front of the house at 3:22am-ish when the Standers pull up. He had to be very close by, IF it is indeed true that he was outside. Why didn’t Baba mention him at all? Is Carice lying that she saw him? I honestly don’t know what to think. The thing that gets me the most isn’t so much that Frank isn’t speaking (people do clam up in these situations), it’s that he wasn’t even mentioned at all by anybody up until Carice. I just can’t figure that out. I do recall Nel establishing with many witnesses (can’t remember exactly which ones right now) if there was anybody else in the house that night other than Oscar and Reeva, and the answer was definitively no. Somehow, someway, if Carice is telling the truth, Frank ended up in front of that house with security that night only minutes after the gunshots. How did he get there, where was he prior, and what made him be outside of that house rather than inside where he normally would be? I’m open to all thoughts on this! Pieter Baba testified that he arrived at Oscar’s house with another security guard. I have just re-listened to Carice’s testimony. Although it’s not absolutely clear how many others were already there, she only identified 2 people: Pieter Baba and someone else who she thought was Frank, but wasn’t sure. Perhaps she was mistaken and it was actually the other guard. Surely if Frank had been there Pieter Baba would have mentioned him? Just a guess, but perhaps Frank had woken up during the argument and had gone outside under the bathroom window to hear what the shouting was about. I sometimes wake up in the middle of the night in a blind panic after hearing a noise but I don’t think I have GAD and I’m pretty sure I wouldn’t fire a gun blindly into a bathroom door, but then I also don’t live in SA where crime is particularly bad. It’s a difficult one to call – OP evidence / defence is all over the place, it’s changed so many times and many things don’t stack up. If his events are true, he must be going through hell! 1) Why was he carrying his gun back and forth after he fired? 2) What was the plastic bags and string for? 3) I find the whole Frank thing very weird. 4) Why didn’t he call the police / ambulance first? One thing that really sticks in my mind. OP started by saying he wanted to tell the truth, then halfway through his evidence he told Nell that he didn’t know the implications of what he was saying. I thought Nell would have made more of this ie, If you’re happy to tell the truth then it doesn’t matter about the implications. If you’re worried about the implications of your answer, then surely it throws into serious doubt whether you are telling the truth? If he is found guilty and sent down, will he be sent to a relaxed jail or will he be in with all those animals in the numbers gang?